Visit our on site shop. In the freezer we stock Coldeaton Jersey Ice Cream in various flavours. Bacon sausage, burgers, black pudding and Derbyshire oatcakes all in small handy packs. In the fridge we have milk, butter, cream from Peak District Dairy as well as our own farm eggs when available. We also have a few basics like porridge pots, toothbrushes BBQ coals as well as anything we find that may be suitable! We also stock a some of the goodies you have in your welcome pack so you can take a taste of your holiday home with you. these include Brock and Morten oils, mayonnaise and vinegars. 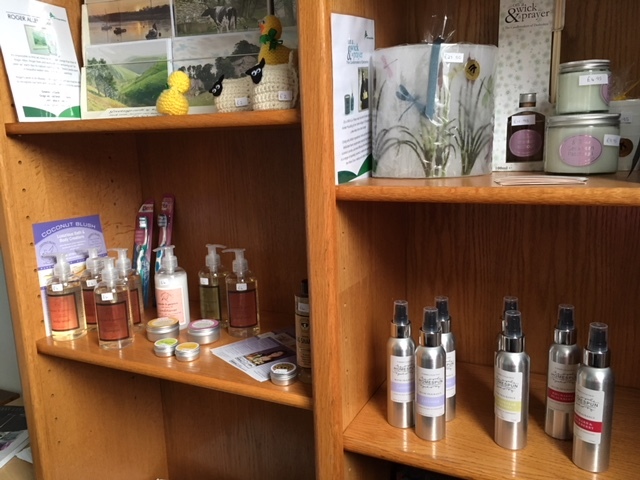 Toiletries from Coconut blush, Hoe Grange fresh coffee, Flour from Caudwells mill which is the basis for our homemade bread and room fresheners from Homespun. Inspired by The Great British Bake off? Then why not book yourself a bread making course at the vibrant artisan bakery in Crich. The Loaf offers hands on courses in standard yeasted doughs, sourdoughs or French baking – you can almost smell the croissants baking! The cost includes all refreshments and ingredients. All equipment you will need is provided and best of all everything you bake is yours to take home. Be inspired to explore all that the Peak District has to offer! Steep and Deep provide high quality adventurous experiences, including rock climbing, mountain biking, caving and mountain skills. 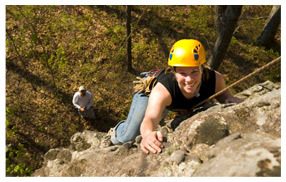 Acclimbatize provides outdoor adventure for groups including, climbing, caving, potholing, canoeing, abseiling and much more. Peak Pursuits – create your own mini-adventure with a half day outdoor pursuits session. Choose from canoeing, kayaking, climbing, abseiling, archery, and orienteering. Archery Events – develop your archery shooting ability with a 2 hour coaching session at Hoe Grange, using fun techniques to help develop specific skill areas. Make the most of the outdoors and enjoy a relaxing fun evening around our log fire pit. A chance to unwind and relax with family and friends. You supply your own entertainment and camp fire songs! Children must be supervised at all times and never left unattended near the fire. Hire our log-fired pizza oven and have fun creating and cooking your own perfect pizzas! We bring the pizza oven to your cabin with logs to burn, homemade pizza dough, passata, and pizza peel. All you have to do is light the fire and add your own tasty toppings! 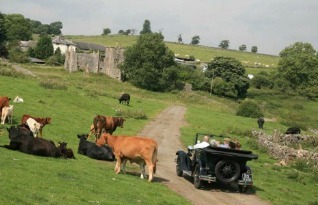 Treat yourself to a Vintage Adventure Tour in a 1929 vintage open top car. With Steve as your guide you'll discover some of the hidden gems of the Peak District, exploring off beat routes with stunning views and stopping off for some tasty treats along the way. Our favourite tours include "Farm Gates and Homemade Cakes" and "Train Tracks and Troglodytes"